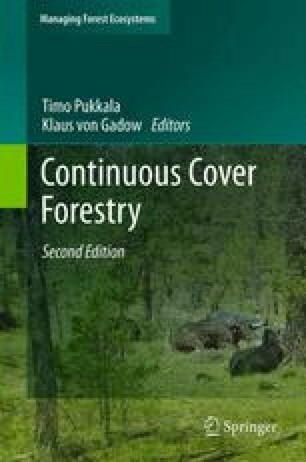 Many well established techniques such as yield tables and age-based growth models are not applicable in continuous cover forestry (CCF). A further complexity in CCF is the need to predict regeneration. It is possible to model CCF using stand-based approaches such as transition matrices and stand table projection but the utility of these approaches is limited. Individual-based approaches are the most promising and may take two forms: cohort-based and single-tree models. While the utility and limitations of site indices based on age and dominant height is well established for plantation situations, there is no dominant paradigm for dealing with site productivity in stands managed as CCF. Alternatives include dendrometric approaches, indicator species and site descriptors such as elevation, slope and soil depth. In even-aged forests, the self-thinning line provides an effective way to estimate mortality in forest stands, but the concept is of limited utility in CCF. With CCF, the best option is to predict individual-tree survival from the resources deemed to be available to each tree. Fertile areas for further research include site productivity assessment and the modelling of regeneration and species interactions.